Patient 1 is a 22‐year‐old man with no medical history who presented with progressively worsening fevers, severe nausea, and nonbloody severe emesis with a diagnosis of infectious mononucleosis. The patient had fevers to 104°F with chills and a pulse of 100. On physical examination, he was ill appearing and diaphoretic. The patient's CBC revealed an H/H. of 10.2/29.7, platelets of 69 with 14% bands, and elevated liver enzymes. A CT scan of the abdomen and pelvis showed hepatosplenomegaly with hepatic steatosis. Chest x‐ray revealed patchy nodular infiltrates. Given the patients positive EBV viral DNA, hepatosplenomegaly, thrombocytopenia, anemia, elevated ferritin and triglycerides, and worsening condition, hematology/oncology was consulted with concern for hemophagocytic syndrome. A bone marrow biopsy was performed that revealed small clusters of hemophagocytic histiocytes. The patient was placed on dexamethasone 20 mg IV daily and ganciclovir 400 mg IV daily. He was discharged without further treatment. Patient 2 is a 20‐year‐old man who was diagnosed with mononucleosis 6 weeks prior to admission. He endorsed a 20‐pound weight loss. The patient was found to have thrombocytopenia, anemia, elevated liver transaminases, positive EBV viral DNA, elevated LDH, ferritin, cholesterol, and triglycerides and diminished haptoglobin and fibrinogen. An ultrasound of the abdomen showed splenomegaly. A bone marrow biopsy was performed followed by platelet transfusion, which was consistent with hemophagocytic lymphohistiocytosis. This patient received the HLH 2004 protocol consisting of cyclosporine, dexamethasone, etoposide, and methotrexate and ultimately a bone marrow transplant. 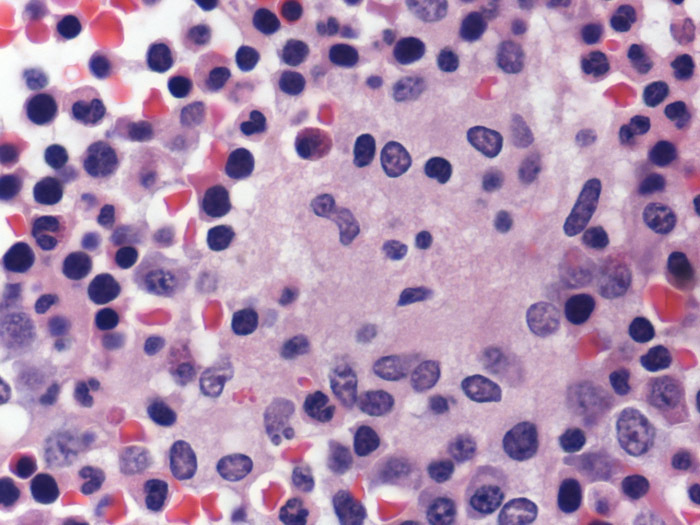 Hemophagocytic lymphohistiocytosis (HLH) is a rare and potentially life‐threatening condition that often goes unrecognized and can mimic the manifestations of other illnesses. Originally described as a primary genetic disorder, a secondary form of HLH due to another precipitating condition (e.g., viral, oncologic, autoimmune) has since been described. In our encounters and review of the literature, we have defined diagnostic criteria to identify patients with EBV‐induced HLH. Common features in both patients were high fevers, pancytopenia, splenomegaly, SIRS criteria, ferritin > 5000, high transaminases, LDH, and bilirubin, low haptoglobin, and a bone marrow biopsy consistent with hemophagocytosis. Studies have demonstrated success with early initiation of high‐dose corticosteroids and, if needed, subsequent treatment with an etoposide‐based regimen and ultimately a bone marrow transplant. HLH is a rare disorder that can be difficult to diagnose given its relatively nonspecific manifestations and similarities to the severe forms of precipitating illnesses. It remains an underrecognized and underdiagnosed condition, especially in adult populations. Given successful outcomes with proper treatment, it is important to spread awareness of this life‐threatening disease. Bone marrow biopsy exhibiting histiocytes containing phagocytosed red‐cell progenitors. Peripheral smear exhibiting a single histiocyte with phagocytosed red cells. 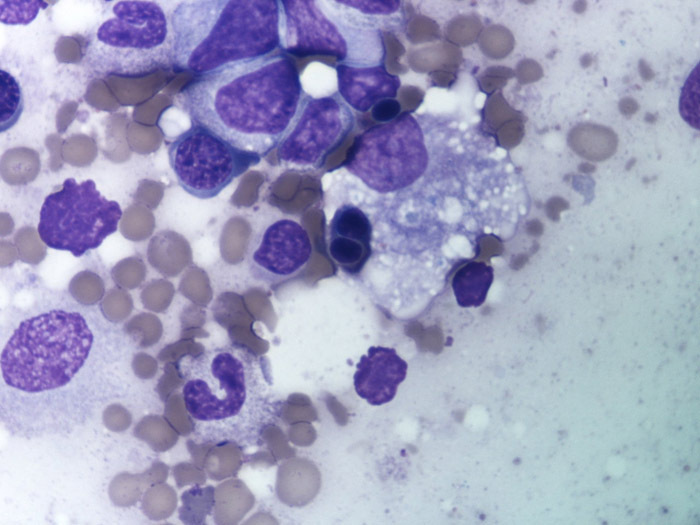 Ulrich A, Snider J, Reid R, Verderese J, He R. Hemophagocytic Lymphohistiocytosis: Two Patients with This Increasingly Recognized Secondary Phenomenon. Abstract published at Hospital Medicine 2013, May 16-19, National Harbor, Md. Abstract 258. Journal of Hospital Medicine. 2013; 8 (suppl 2). https://www.shmabstracts.com/abstract/hemophagocytic-lymphohistiocytosis-two-patients-with-this-increasingly-recognized-secondary-phenomenon/. Accessed April 21, 2019.